When I tell people I live in Las Cruces, New Mexico, but work at Kitt Peak National Observatory outside Tucson, Arizona, one of the first questions I’m asked is some variation of how that works, especially once they realize the two points are approximately 325 miles apart. The answer is that I have a dorm room at the observatory. Here’s what it looks like. Of course, the reason this is the time of the short sleeps is because of the long winter night. At optical observatories, we try to maximize the time we’re on the sky and that means data taking starts soon after sunset and finishes just a little before sunrise. To get the telescope ready for observations, I actually have to be at work before sunset. How close to sunrise we work in the morning depends on the scientific requirements of the program, but it’s not uncommon for me to work right up until sunrise. This time of year, it’s not uncommon for me to get six hours of sleep through the day before starting another day of work. Even if I wanted to commute 325 miles each day, it would be impossible. For that matter, living closer wouldn’t necessarily help. It’s still 50 miles to Tucson. I’m often asked whether I can write during my long nights at the observatory. The reality is that work takes enough of my attention that I really can’t compose new material while I’m at work. However, sometimes we do get into situations where I’m monitoring a long exposure and just need to look up from time to time to make sure the instrumentation is behaving as expected. During those times, I find I can edit stories. I also sometimes bring a good book to keep me company on a long winter’s night. A casual observer will likely notice from the photo of my room that I’m a fan of Cowboy Bebop. Of course, followers of this blog will know that I’m generally a fan of space cowboys and space pirates. A closer look at the photo will reveal some badges from past conventions tacked to the bulletin board in the background. My schedule is such that it’s not uncommon for me to go from an event directly to work at the observatory. My favorite things in this photo, though, are two things made for me by my family. My wife made the crochet jackalope next to my bed, which helped to inspire the jackalope harvesters in my Clockwork Legion novels. My daughter drew the lightning wolf picture which hangs to the right of my bed. The lightning wolf is, of course, the mechanized bicycle designed by bounty hunter Larissa Crimson in the same series. I’ve shown off both of these in more detail in other posts. As a writer, one of the things I most appreciate is my family’s support. My family enjoys going to science fiction and steampunk conventions and is willing to help me out. They’re there to help me through the inevitable bad review and cheer me on when I get a good review. They enjoy many of the same shows I like to watch for research and inspiration. They’re also extremely creative in their own right. My youngest daughter, in particular, likes to create things inspired by my writing as well as books and movies I like. A couple of years ago, she created this interpretation of Larissa Crimson’s lightning wolf from my Clockwork Legion novels. In the novel Lightning Wolves, the army attempts to recruit Professor Maravilla to help build more effective war machines to help repel the Russians, who have invaded America. The professor, however, has had enough of war machines and doesn’t want to go. Larissa, a bounty hunter who has apprenticed herself to the professor, agrees to go in his place. Like most real-world inventions, the lightning wolf is a hodgepodge of things Larissa had on hand at Fort Bliss in the novel. 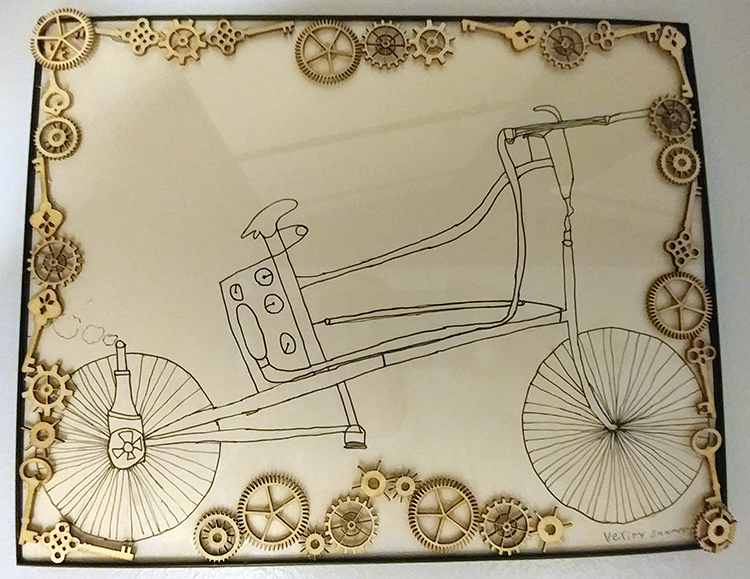 She adds the engine from an ornithopter to power a safety bicycle, which holds one of the army’s lightning guns between the handlebars. In effect it’s an armed, steam-powered moped. In the novel, few people take this frail-looking contraption seriously until they see it in action and see the damage it can cause. It ultimately proves itself an effective weapon against much larger machines. She returns to Professor Maravilla and the two join forces against common foes in the last act of Lightning Wolves. In many ways, Larissa and Maravilla are a family, even if they aren’t related by blood. Their relationship is fraught and sometimes tense. People on the outside don’t always understand it, but when one is in trouble, the other will be there to help out. In essence, my family is not just there to provide moral support, but they do provide the experience that helps me build effective characters and relationships on the pages of my books. As writers, we should always keep a lookout for those things around that we can use on the page. Like most inventors, Larissa is not content with what she built. As the series proceeds, she tinkers, improves, and takes the lightning wolf to new levels. We see the upgraded version both in my novel Owl Riders and in my short story “Fountains of Blood” in the anthology Straight Outta Tombstone, which is coming out in a mass market paperback edition this fall. On Wednesday, June 13 at 1:30pm, the Friends of the Branigan Library in Las Cruces, New Mexico have invited me to present a Book Talk about my Clockwork Legion novels. I’ll be presenting at the library’s main branch at the corner of Picacho and Main Streets. I’m proud to have called the Mesilla Valley my home for the last 23 years. It’s a real honor to give a presentation and reading in my home town. Garnering an interest in history from family trips as a child, I brought my interests together in the Clockwork Legion novels. 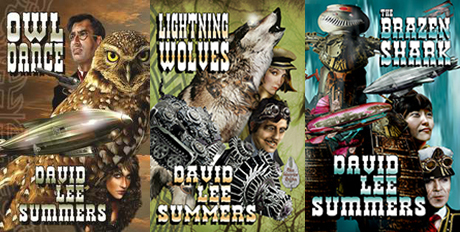 The Clockwork Legion series includes four novels: Owl Dance, Lightning Wolves, The Brazen Shark, and Owl Riders. In the Clockwork Legion novels I combine science fiction and history to imagine a world that wasn’t, but could have been, weaving stories reminiscent of those told by H.G. Wells and Jules Verne. The Clockwork Legion novels follow the adventures of Ramon Morales, a former sheriff of Socorro, and Fatemeh Karimi, a healer from Persia. During their adventures together, they meet inventors, outcasts, misfits, and even pirates who they gather together when the Russians use airships to invade the Civil War-ravaged United States in 1877. The third novel in the series, The Brazen Shark, was voted Best Steampunk Novel in the 2017 Preditors and Editors Reader’s Poll. The fourth novel in the series, Owl Riders, was just released. I’m an active member of the Science Fiction and Fantasy Writers of America and a former vice president of the Science Fiction Poetry Association. My poems have been nominated for the Rhysling and Dwarf Stars Awards by the Science Fiction Poetry Association. In my presentation, I plan to talk about the history of steampunk and weird western stories. I also plan to talk about how I got started writing steampunk and weird westerns in general as well as how the Clockwork Legion novels in particular came about. I’ll give a couple of readings and I will have books available for sale at the talk. I gather refreshments will be served as well. If you’re in Las Cruces, I hope you’ll join me for this fun Book Talk. I look forward to meeting you. As my forthcoming novel Owl Riders opens, we learn that the Chiricahua Apache have taken Fort Bowie in Eastern Arizona territory with the help of Battle Wagons modeled on the Javelina mining machine left behind by Professor Maravilla. I use Fort Bowie in the novel because it has both historic and symbolic significance. 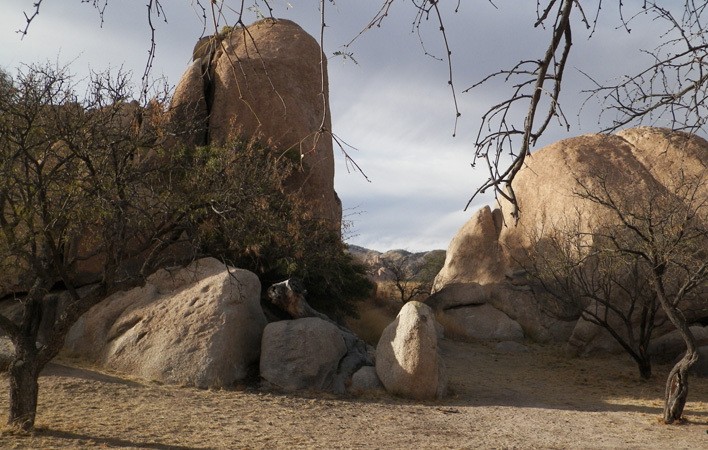 Fort Bowie was established at the site of the Battle of Apache Pass where the United States Army fought Cochise. 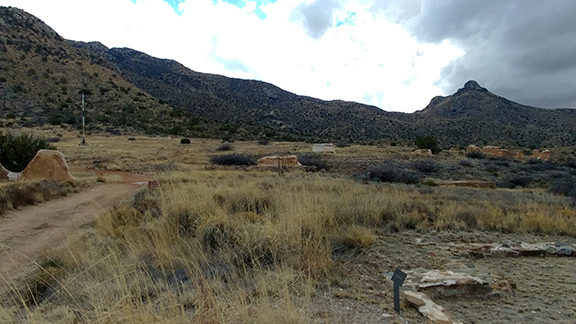 The fort’s purpose was to guard the water at Apache Pass, necessary to the famous Butterfield Stage, and to “control” the Apaches in the region. If Apaches were given machines that could capture the fort, it seems likely they would take an opportunity to do so. 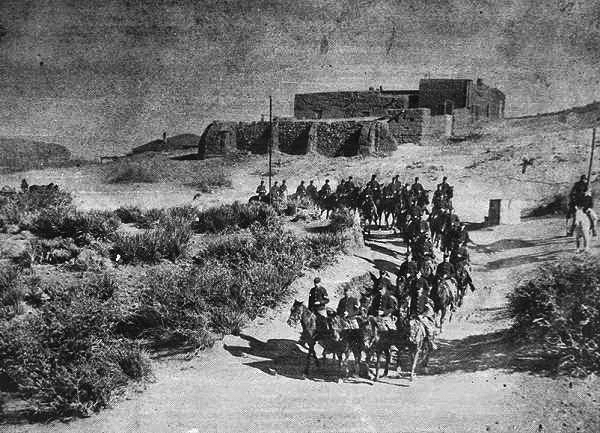 Here’s a great classic image of soldiers riding out of Fort Bowie. Here’s basically the same scene as it appears today. Pretty much what exists now are foundations and a few walls. Some of the walls stand just a little over my head. What it lacks in intact buildings, it makes up for in giving you a sense of the facility’s scale. There’s also a nice, albeit small visitor center where they talk about the history of the fort. 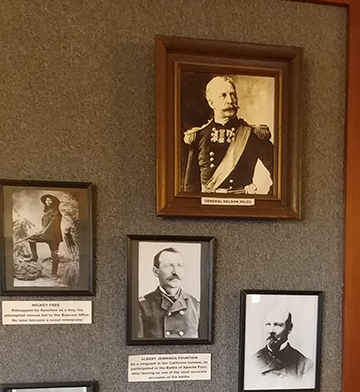 It was great to see faces I recognized right on the visitor’s center walls. For example, I walked in the door, turned around and saw General Nelson A. Miles (at the top in the photo below) right above Albert J. Fountain (in the center below Miles). Miles is a major antagonist to both the Apaches and Ramon Morales in Owl Riders. Fountain has appeared as Billy McCarty’s defense attorney in The Brazen Shark and he returned in my story “Fountains of Blood,” which appeared in Straight Outta Tombstone. His memorial is about a quarter mile behind my back door in Las Cruces, New Mexico. What intrigued me almost more than the story of the fort and the soldiers who served there was the connection I made to the Native Americans I talk about in the books. 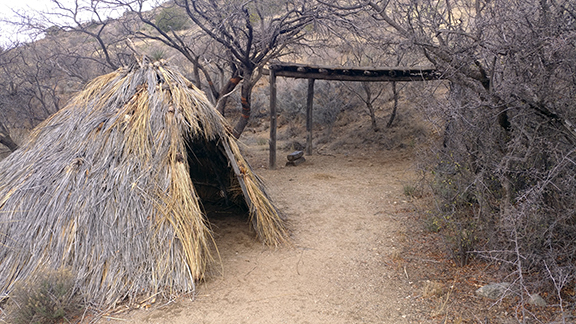 Along the trail to the fort, they have a setup of an Apache camp, including a wickiup. I describe these camps both in Lightning Wolves and in Owl Riders, so it was exciting to see one up close and even go inside. Also, in both Lightning Wolves and Owl Riders, I talk about the importance of knowing where to find water. 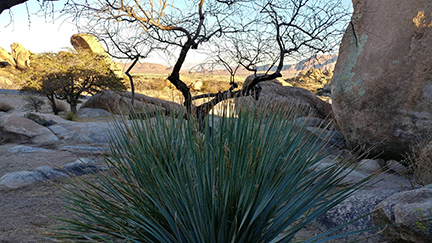 For those who drive along Interstate-10 in Southern Arizona and Southern New Mexico, it’s not obvious that there’s water anywhere in the region. However, as I mentioned at the outset of the post, part of the reason for Fort Bowie was its proximity to reliable water. 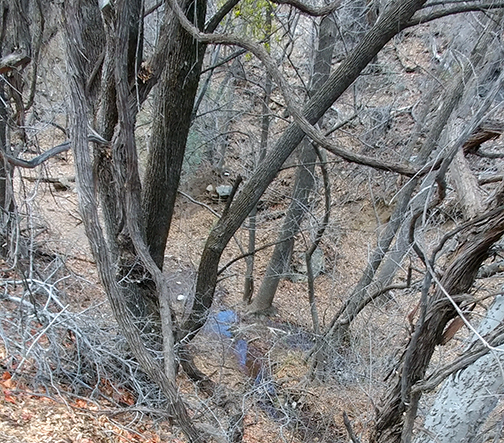 So, it was great to see this actual spring a mere dozen miles from the Interstate where the land appears so barren. 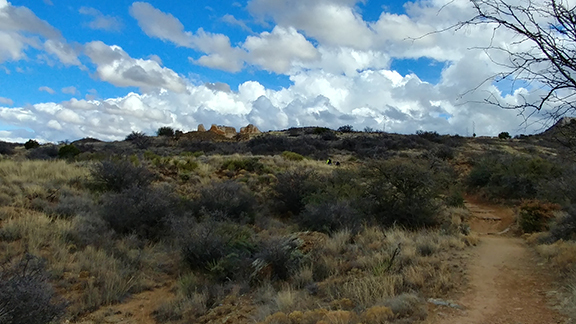 Visiting Fort Bowie was a fascinating walk back in time. The site is about twelve miles south of present day Bowie, Arizona. Once you get to the parking area, you have to hike about a mile and a half to get to the site. Along the way are signposts describing aspects of the area’s history. If you go out, I’d recommend allowing at least three hours to explore the site. Be aware it can be hot and storms can come up suddenly in that part of Arizona, as they did the day I was there. I was rained on for part of my trip. Bring water and suitable clothing. A picnic lunch would also be nice. Today, we have another Arizona stop on the Airship Ambassador’s Steampunk Hands Around the World Road Trip. I enjoy giving places I’ve visited and read about a steampunk twist in my Clockwork Legion novels. Today’s stop is a dramatic place on Interstate-10 in Southern Arizona that I imagine many people drive by with barely a glance: The Dragoon Mountains. The Dragoons feature prominently in book two of my Clockwork Legion series, Lightning Wolves and in book four, Owl Riders. As it turns out, I drive through the Dragoons just about every week on my commute to and from work. Some of these photos are from 2014 when I made a stop to refresh my memories about some of the details of the region while preparing the novel for release. 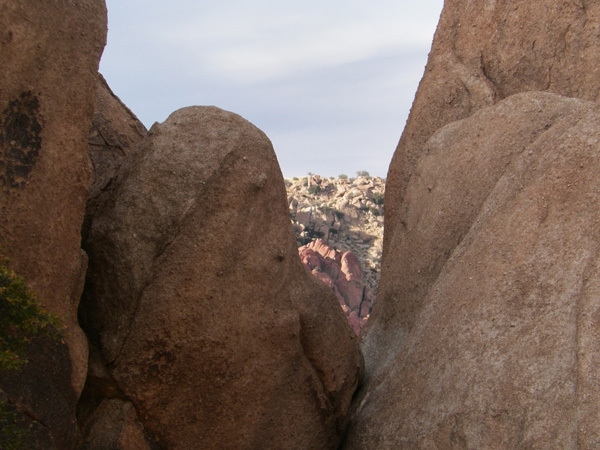 The Dragoons are very dramatic and rocky mountains. They were also the source of real-life wild west drama. The Apache Warrior Cochise defeated a company of Confederate dragoons there in 1862 and stole their cattle. Hence the name of the mountains. The Confederates and the Apaches clashed again just a few days later and the soldiers reclaimed their livestock. Twenty years later, during Wyatt Earp’s famous Vendetta Ride, Earp’s posse captured and killed “Indian Charlie” Cruz in the Dragoons. Lightning Wolves is set between these two historical events. In the novel, many of the soldiers who would normally have been in the area have been called to fight a Russian invasion in the Pacific Northwest and the Apache Warrior Geronimo has set up a stronghold in the Dragoons. Needless to say, this makes some of the remaining settlers, such as Newman Clanton and his sons very nervous. In the middle of all this is exiled Mexican inventor M.K. Maravilla and the bounty hunter Larissa Crimson, who are in the area building a mining machine for a pair of prospectors. What happens makes the Gunfight at OK Corral look like a petty squabble. As it turns out, I revisit this setting in book four of the series, Owl Riders. This fourth novel is set eight years after Lightning Wolves and the Apaches once again use the mountains as a place to make their stand against white settlers. This time, they are armed with battle wagons based on Professor Maravilla’s mining machine and they face off not against the Clantons, but Wyatt Earp and Doc Holliday. Since we’re in the neighborhood, I’d be remiss not to drop down to the town of Tombstone. 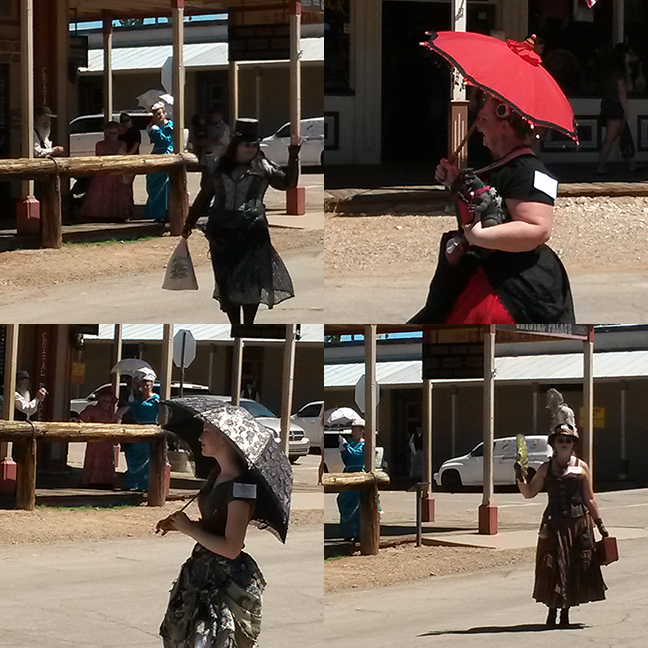 The scene of one of the wild west’s most famous gun battles might not seem very retrofuturistic, but the city of Tombstone is very welcoming to steampunks who want to strut their stuff in parades such as the Helldorado Days Parade in October. Also, Tombstone is a veritable shopper’s paradise for Victorian era clothing that you can use when building your steampunk wardrobe! I hope you’ve enjoyed this steampunk road trip stop. If you would like to explore Lightning Wolves and all the places visited in the novel, you visit http://www.davidleesummers.com/lightning_wolves.html to get more information and find all the places the novel is available. These last days of 2017 find me hard at work polishing Owl Riders, the fourth novel in my Clockwork Legion steampunk series. My editor has given me his notes and my revisions are due this Wednesday, December 20. While I don’t have a final publication date yet, Larry Bonham at Sky Warrior Publishing indicated they were shooting for a spring release. In the series, the alien called Legion has unleashed humanity’s potential in the nineteenth century. Now, Legion has gone. The United States Army with its ornithopters has reached a standoff with Apache warriors armed with mighty war machines. Ramon and Fatemeh’s exploits have been immortalized in a novel called Owl Riders. Now Ramon is called away to solve the dispute and Fatemeh’s one-time betrothed arrives on the scene. I hope you’re looking forward to this fourth installment in the series! Because of staffing changes at Sky Warrior, I’m working with a new editor. This is always something of a nervous thing, especially given that I’m an introvert who doesn’t find it easy to open up to new people. I’m showing something I’ve worked on for much of the past year to a complete stranger and hoping they “get it.” Of course, I hope that’s true with any reader who buys one of my books, but I’m trusting the editor to help me find ways to make my narrative clearer and more palatable to readers. In this case, my new editor has made very few suggestions about actual scenes. Instead, he’s suggested a rearrangement of scenes to provide a more clear narrative flow. He also suggested reducing the number of point of view characters. On one hand, I feel like having a small number of limited third-person points of view is largely genre fashion right now. However, I do have to admit that applying this advice has helped me tighten several of the story arcs without having to do much rewriting. Will there be more novels in the series after Owl Riders. The most honest answer I can give is “I hope so, but it depends.” Owl Riders was written such that I endeavored to wrap up as many dangling plot threads as possible from the first three books. Also, I built a trilogy where an alien being significantly altered the flow of history. I wanted to explore what happened after this alien influence had moved on. In that sense, this book serves as a conclusion to the series. That said, I’ve attempted to set the world up such that I could continue to tell stories with these characters in new situations. One could see it as the first book of a new story arc, or possibly a transition from the old story arc to a new one. In fact, my story “Fountains of Blood” in the anthology Straight Outta Tombstone is set about ten years after the events of Owl Riders, so new stories can definitely be told. In the end, a lot will depend on how well all the books continue to sell. That will determine my publisher’s interest in acquiring more books in the series. If you’re already a fan of the series, please spread the word. If you’ve dropped by this post and I’ve piqued your curiosity about the books, you can explore more at the links below. You can read the first chapter of each book as well as find links to your favorite retailers.